You know what would be fun? To try and make a NES port of this I'd actually like to try that myself. Not yet, as it's not functional enough yet. Here comes RPG Desu: Opossamu Massaji Shimyureta! 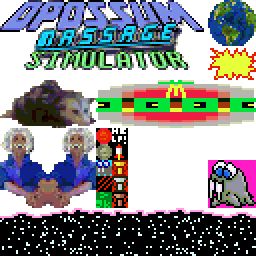 Or It Is RPG - Opposum Massage Simulator! Lol, actually the official title will remain the same as before, but in Japanese this would be the title. I haven't progressed on this in a while due to me working on CE Textlib-related stuff, but I recently had an idea for an extra game mode: Once you get all achievements, the game would go one step further in massaging unlikely animals, and the title would be replaced with a textual "Crocodile Massage Simulator". The opossum sprite would then turn green, not looking anywhere close like an actual crocodile, and its first 8 rows of pixels be chopped off, because why not? Of course the story would change all instances of "posum" and "opossums" with "croco" or "gater" (sic). One bad move and the game would be over. That sounds cool! And also, if you plan on porting this to the CE, would you have to slow it down due to the CE's speediness? Probalby not. I might instead improve it for the CE, if I work more on it.The game is actually intended for the CE in the future but I am trying to make it run at challenging enough speed on the CSE in the meantime. I'm providing a Windows version for now but i'll release on Nspire as well. Press X to Massage and Space to start. -Prior title screen, add the It RPG Is! logo (which is pretty much a ripoff from LJN logo, with colors in the wrong order). So I hope you plan to update your game once mine is complete. EDIT: Oh I see, it's a different story . But I can't get past the first intro screen D: EDIT Nvm you have to press X. Also lol at the current game over screen.